Serpiko is a 1/2 Argentine male. 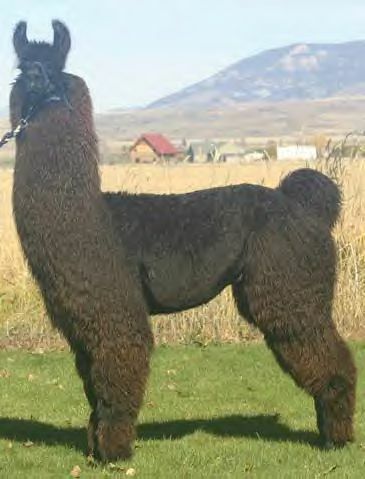 Like his sire Argentine Kobra (shown below), he has heavy bone and an abundance of fiber. 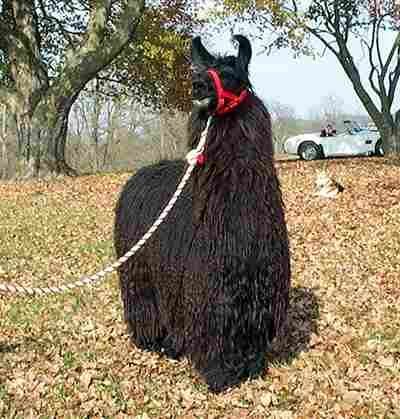 His luxurious silky fiber has enabled him to consistently place in the top three in walking fiber classes. Serpiko has great conformation, and wonderful ears. Serpiko will be available for limited breedings, and will add superb genetics to any breeding program. From the day he was born this male has been truly special. 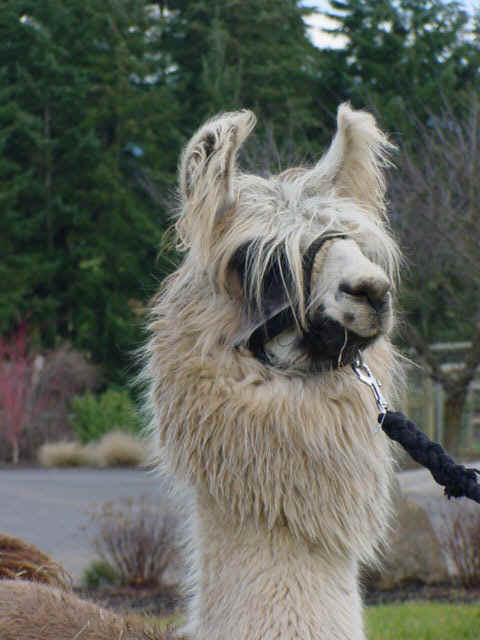 We thank Leila and Larry Crumrine of LC Llamas for the opportunity to allow us to own this male, and congratulate them on their excellent breeding program. Serpiko has already contributed to our own with his first three crias on the ground. And then we have Tillman's Bueno Chico, a Chiri Chico son. 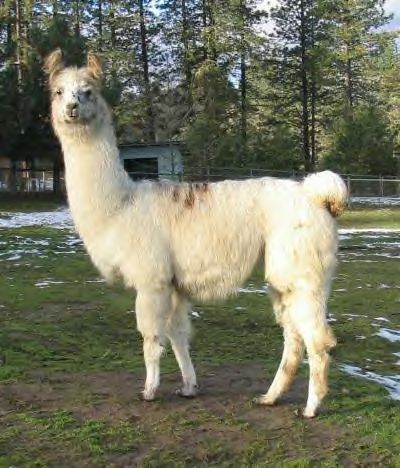 We would like to thank Legacy Llamas for allowing him to share our life. Bueno Chico is an upcoming stud with "appy" pizazz. He has outstanding presence, a great personality and a champion's lineage. 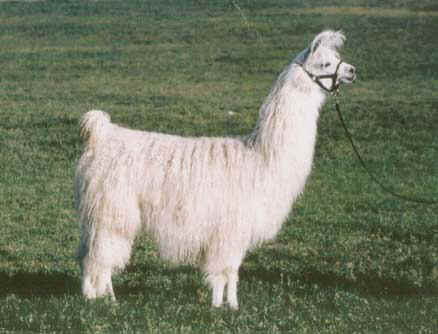 He is a full Chilean grey and white appy with very silky fiber that possesses a lot of curl. His sire, Chileno Chiri Chico, is 47" at the withers, a white and gray dilute appy, with fabulous fiber and a wonderful show record. Bueno Chico's paternal grandsire, Chasca, is also the sire of Chamoso and Shock and Awe, to name a few; and he has size, beautiful coloring, and a wonderful disposition. We are looking forward to adding Bueno Chico's crias to our program. 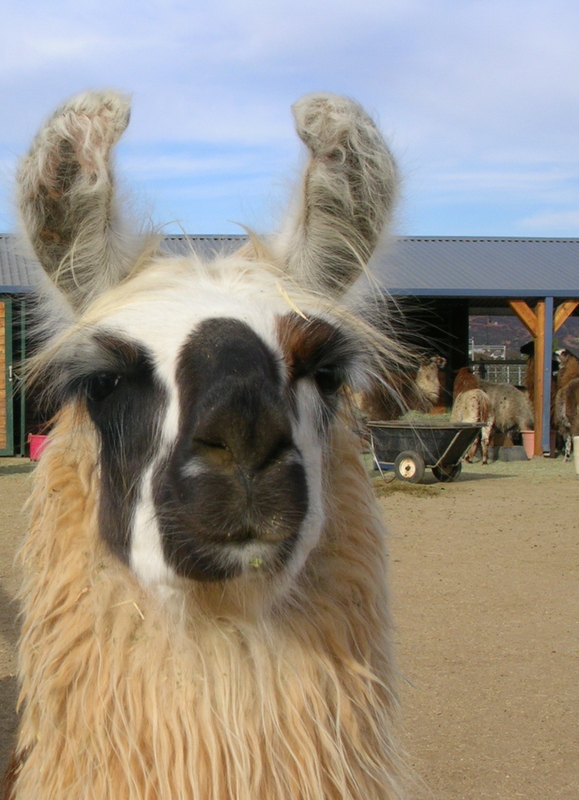 Shown here is his dam, Buenos Noche, a Chilean import (1995) who has recently moved from Tillman's Ranch to Feld/Griesel llamas.. Buenos Noche, is a white suri who breeds and births easily with great milk production. She consistently reproduces suri fiber and appaloosas! She is also the grandmother of our newest addition, Sizzlin' (below) who is also a Chilean Napoleon granddaughter. Sizzlin has a hot full Chilean pedigree. Sired by Silverspirit, the gray, heavy wooled Chilean Import, who is the producer of champions for Hinterland. Sizzlin�s mom (Bibiana,shown below) was a reverse appaloosa daughter out of Chilean Napoleon. Napoleon who produced ALSA and Futurity Champion and over 33 % appaloosans. 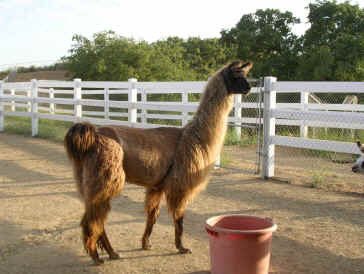 Sizzlin's Prime Plus One cria (Shimmerin') was born at the Tillman Ranch on May 12 (see our cria page). Prime Plus One is a tall, white, Papa Noel son. He was a Celebrity top 5 futurity winner as a yearling and top five last year in the Get of Sire class. Shimmerin' took first place and Reserve Grand Champion in her first ALSA show at Del Mar, CA. 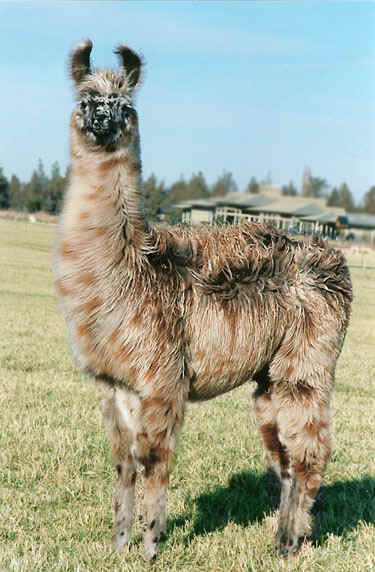 Sizzlin was rebred to Overexposed, the Celebrity Get of Sire 2nd Place winner in 2005, for a late spring cria. 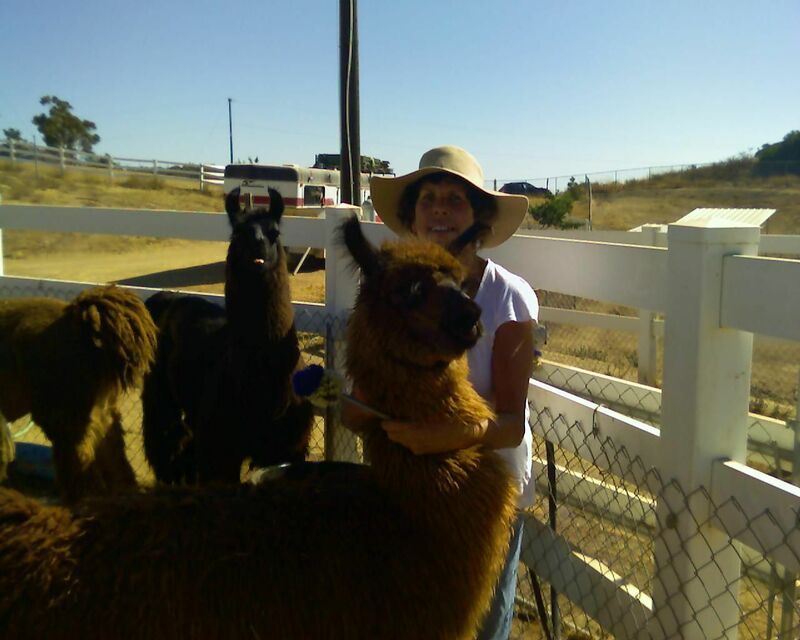 We also welcome the arrival of Ba Ha La Na from GrandHarvest Ranch. Ba Ha is our second Merit daughter. She shares with her sister, Beacon Hill's Flying Merandah, beautiful fleece and coverage. In addition to being breathtaking, Susan Kovacs told us that the best thing about BaHa is her personality. "She is an absolute angel, and everyone loves her. She enjoys being petted, and stands so still and calm next to you." Indeed, we have found this to be very true, and are very much enjoying her addition to our herd. 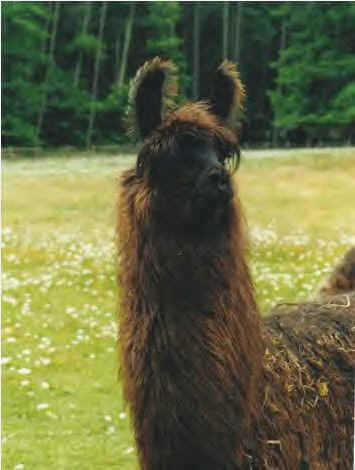 Ba Ha has been bred to Billy the Kid of Tunitas Creek. Thank You Susan Kovacs for sharing this lovely girl with us, and Congratulations, Susan, on your outstanding showing at the 2005 Celebrity Futurity. 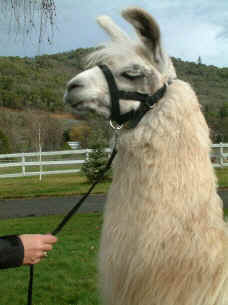 Thank you Liz and Allen Victor (Bolt Mountain Llamas) for this sweet and lovely girl. You can not resist running your hands through the luscious, silky fiber of this freckle faced appy sired by J.J. McCool, a striking appy, who is passing on his flashy colors and fine locks. Like her sibling, Keisha Kate, Moon Shadow has a beautiful freckled face, draped in abundant silky head wool! She also has excellent conformation. 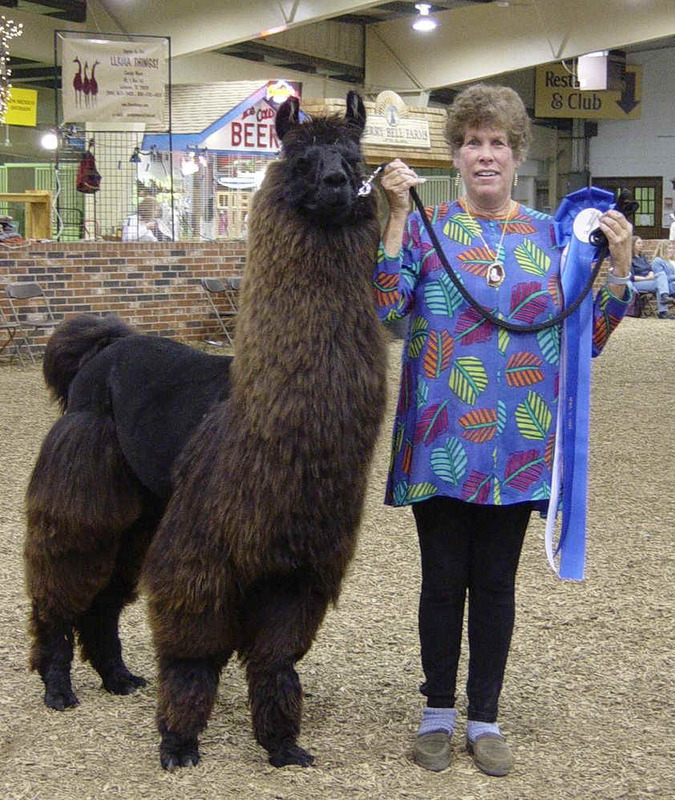 Chaance just won Reserve Grand Champion at Del Mar (2006). And she went to the Western Regional Classic. We agree with Lynda Feld from whom we purchased Chance. We can not say enough about this girl. The one thing we discovered about Chance last summer is that she is a water baby. She spent most of the time sitting in our kiddy pool. It did not do much for her wool, but fortunately her excellent conformation became even more obvious. We were excited to add Peruvian Torrie, the daughter of Peruvian Ciervo, to our herd. 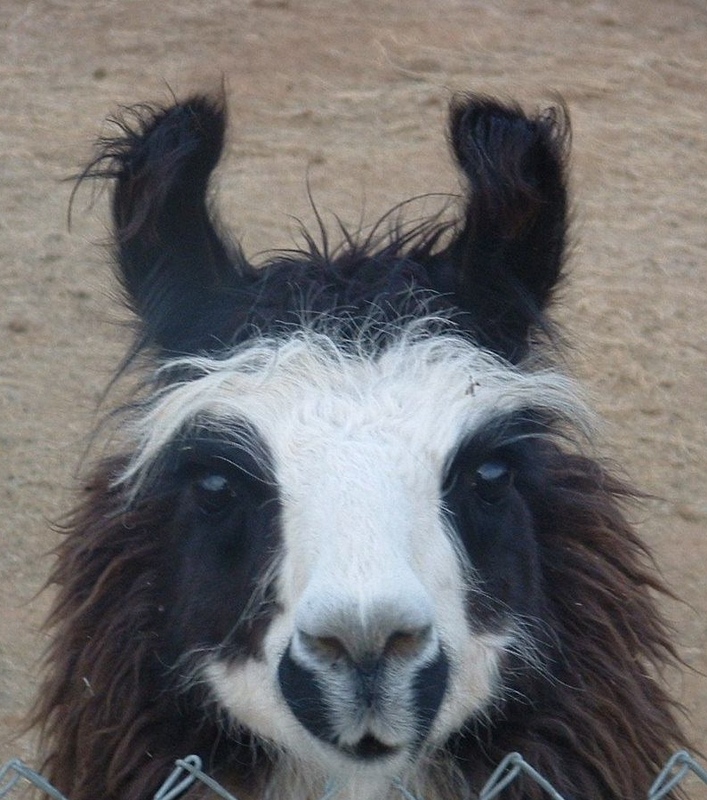 She is a stretchy Peruvian Commodore granddaughter with a lovely head, luscious color, and fine, silky fiber . Torrie is particularly fun as she absolutely loves to play. We frequently find her pronging with our new crias and playing with balls or barrels. She is so sweet. Now that she has her own cria, Enchante, she is in her element. Thank you, Jim and Jan Chapman. Kismet has recently joined our ranch. This BVR Midas granddaughter is one of our friendliest girls.